French twill is a lightweight and sturdy, woven from 100% cotton. Brushed on the outside for strokable softness, the inside in the tail is smooth for ease of adjustment. Its light weight makes it ideal for warmer climates and summer weather, while giving it a drape one doesn't usually find in twills. In the winter, it lends itself to easy wearing without heating you up too much with extra layers. It can be as plain as you like, or consider it a blank canvas for a tail accent. Age/weight range: Wonderful as a starter sling with newborns; its easy adjustment makes it great for learning to use a sling. 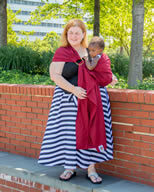 Though it's lightweight, the weave allows comfortable carrying through the toddler years as well. Deep stormy gray, this not-too-dark neutral goes with everything. Dressed up or down, an inexpensive, but never cheap, little-black-dress of a sling. Pair with any color rings for some pop. Chocolatey like cocoa powder, but never bitter, only sweet. Pink with just a touch of violet, this mauvey tone is surprisingly versatile. A terrific warm tone that pairs equally well with denim or yoga pants. Sea salt optional. Light and sunny, like my grandmother's kitchen and my memories of her. A timeless staple, navy blue is another neutral that coordinates with just about any color. A little more gray than your typical olive, this is a subdued green. Well-washed denim in tone, this is a grayish blue that I think makes a terrific go-with-everything sling. If you're looking to dye your own sling, this is a great place to start, or keep it as-is for a tonal neutral. Like its sibling in linen, this green will have you reliving those gorgeous first days of spring. Rich and saturated, this sangria pairs well with any activity. More off-white to the beige side than silver gray, this has a hint of tan. Very like the stone from which it takes its name, a sea-green with blue undertones, perfect for summer or memories of it.